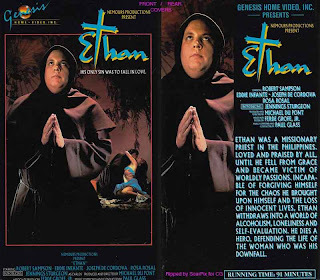 About a year ago, I came across an extremely obscure film on VHS called "Ethan" made in 1964 by producer-director Michael du Pont and filmed on location in the Philippines, yet is an American production. It's a drama-exploitation film about a Catholic priest in a small Muslim town who is seduced by a woman and is almost killed by her father, resulting in the priest to abandon the Church and go off to find "himself". Honestly my plot description doesn't do the film any justice, but I do feel it is a very good film that contains a great music score and honest performances. What makes this film very interesting is some of the cast and crew: playing the woman is Rosa Rosal, who started out in early 40s Philippine cinema and still does small roles, but is heavily involved in the Philippine National Red Cross (check imdb.com for her achievements...very impressive), "Blood Island" regular Bruno Punzalan plays the woman's father, cinematographer Emmanuel Rojas worked with the legendary Geraldo de Leon. Perhaps the most interesting performer is Robert Sampson who plays the priest; Sampson is best remembered for playing the father in The Twilight Zone classic 'Little Girl Lost' and playing Dean Halsey in Stuart Gordon's "Re-Animator" (1985). Despite having a wide variety of TV and movie credits, "Ethan" is Sampson's one-and-only starring role and is quite good in the film. The info on "Ethan" is very limited; the imdb.com even has two listings for it, one in 1964 and the other 1971. The end credits reveal a copyright date of 1964, so it's quite possible that it had a very scattered release. Its early VHS release came about in the early 90s when Genesis Home Video put it out. As with most of Genesis' releases, the picture transfer quality leaves a lot to be desired: "Ethan" was filmed in the 2.35:1 Techniscope-Technicolor format and thus the image is very badly panned-scanned. Nonetheless, I enjoyed the film so much that I decided to seek out info on it. 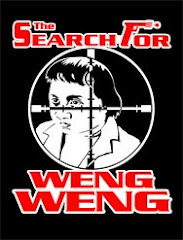 I was able to get in touch with Ferde Grofe Jr., who was the associate producer on the film. He has been very helpful in giving me what info he has on the film. I'm also trying to get in touch with the producer-director Michael du Pont, as according to Ferde he is the one who owns the rights. So far, it's been a bit difficult to get in touch with Michael so that might take a while. Then, I was able to speak with the music composer Paul Glass two months ago and told me what he knew about the film. Now teaching in Switzerland, Paul did music for such films as "Lady in a Cage", "Bunny Lake is Missing" and "Overlord".